Ever wish there was a movie that didn’t involve zombies, drug cartels, robots, or superheroes facing off in a post-apocalyptic end-of-world scenario? It seems more often than not these days, that those types of films are taking up all of the theaters at your local movie theater. Luckily, every once in a while, we get something different, kind, and magical. This time of year, we are so very fortunate to get one of the absolute BEST films of the year, if not in the past several years with ‘La La Land‘. Director/Writer Damien Chazelle (‘Whiplash‘ & ‘10 Cloverfield Lane‘) has gone back to the music roots and made this ode to the golden age of Hollywood musicals, but set in present day Los Angeles with stars Emma Stone and Ryan Gosling. 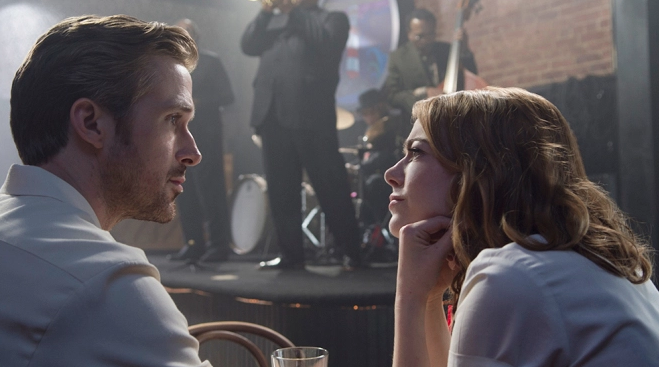 Chazelle really hit home with ‘Whiplash‘, but ‘La La Land‘ is a more light-hearted take of music and love as a musician (Gosling) and actress (Stone) cross paths in Los Angeles, fall in love, and sees if their relationship stands the test of time and fame as both end up making it in their respective fields. This film really highlights the talent of Chazelle, as each dance and music number is perfectly scored, choreographed with excellent attention to detail in every moment. He pays homage to the old days of cinema without hitting you over the head too often and makes you fall in love with these amazing, yet flawed characters. Gosling and Stone deliver outstanding performances and yes, actually sang and danced on their own, in addition to playing their own instruments. The result was simply magical with an excellent jazz score that I can’t stop listening to. 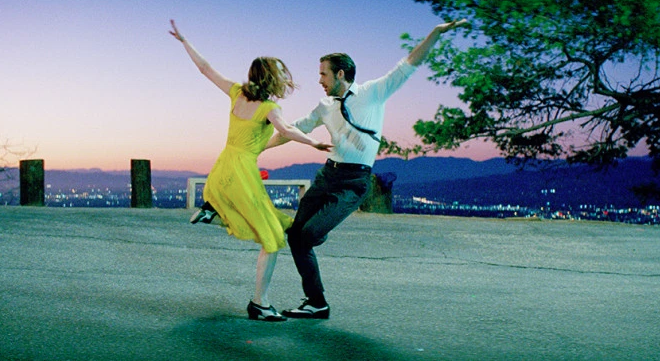 ‘La La Land‘ is such a beautiful film that you will be immediately entranced in its brilliance from the first scene, which is a “one-take” scene that was shot on location on a 1oo foot bridge ramp in Los Angeles with over 100 dancers taking place in the opening musical number in a simulated typical L.A. traffic moment. The colors and choreography are just incredible and paves the way for the rest of the film. ‘La La Land‘ is a perfect blend of comedy, drama, and music- and one breathtaking visual experience after another. This film will be watched over and over again for many years to come. ‘First Man’ Film Review #2! This entry was posted on Wednesday, December 14th, 2016 at 1:51 pm	and is filed under Film, News. You can follow any responses to this entry through the RSS 2.0 feed. You can skip to the end and leave a response. Pinging is currently not allowed. « VIP’s Holiday Havoc 3D Is Happening!